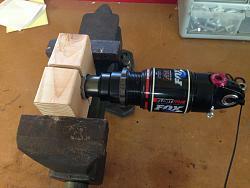 Best way is to drill out 1 1/4" hole with hole saw on a block of 2" X 4" than cut in half. 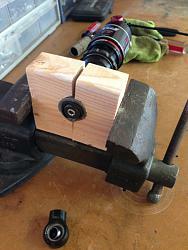 put an old grip piece around the shock shaft and put in a vise as shown in pictures. 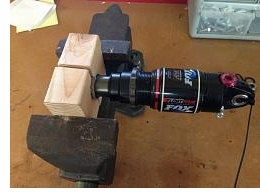 Just need a 2x4 block, an old grip (or other rubber that will keep the shaft from getting marred), and a 1 1/4" hole saw. This way you do not damage the shock when doing the extension install.